On March 5th the Board of Directors of FIAA had their regular Meeting during which they meet with the New Minister of State for Protection of Entrepreneurship in Albania, Mr. Eduard Shalsi. 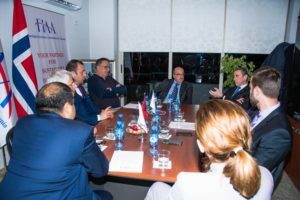 The Board welcomed Mr. Shalsi in the premises of FIAA and addressed to him different obstacles that the Foreign Investors are facing in Albania. They highlighted the value of the White Book Document FIAA has prepared, which, can be a good starting point for the Minister to follow his agenda as an Advocate of the Business and Business Climate. For the FIAA Board, creation of Technical Working groups for each industry would be an efficient tool to better work on the addressed business concerns. The Minister assured the Board for his commitment on following up the proposed concerns by screening them one by one and identifying the most urgent ones. He also highlighted his attention on promoting and facilitating inter-institutional cooperation among Ministries, which according to the Investors is very low. For Minister Shalsi, the foreign investments are considered to be necessary for sustainable economic development and growth of the Country and for him, meeting with the FIAA Board serves to better understand the institutional and legal obstacles that foreign companies are facing while acknowledging the positive steps taken so far. Minister Shalsi considers the Foreign Investors as partners, who in the same time serve as ambassadors for the presentation of the extraordinary opportunities that Albania offers.